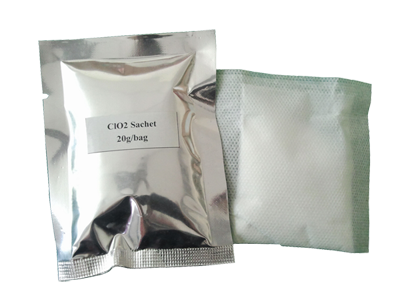 Description: Chlorine Dioxide (ClO2) Sachet are a chlorine dioxide delivery agent product for use as a deodorizer and odor eliminator. The specific powders are impregnated in the sachets. When exposed to moisture in the air, the sachets produce chlorine dioxide gas to destroy unpleasant and unwanted odors at their source. The sachet absorbs water in air to release chlorine dioxide gas to environment for odor removal/eliminator. ● restrooms ● cars ● refrigerators/freezers ● health care facilities ● trash cans ● basement ● closets ● laundry hampers ● drawers ● greehouse ● animal room/housing etc.. The user simply opens the outer package, hangs, places or adheres the inner sachet in the area to be deodorized, and the unwanted odors disappear. When the ambient is very dry, it is better spray some water to the weave-sachet. DO NOT OPEN INNER SACHET!!! 20 g/sachet: Treat up 20 to 40 ft2 of space for 1 month. Other pack size can be produced accordingly.